Now I know that I have been cutting tomatoes the wrong way all the time. You may argue that there is no right or wrong. But be honest, this is definitely a more efficient and smarter way to cut tomatoes. 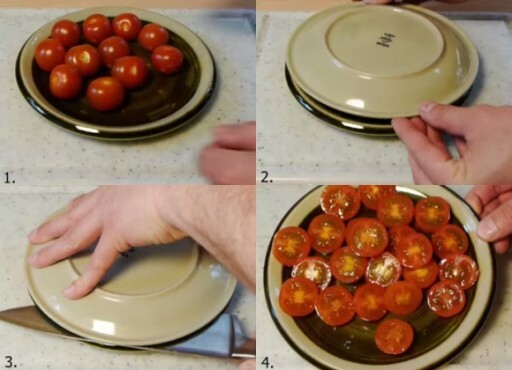 Put all tomatoes on a plate, and then cover them with another plate. Gently push the two plates together, and carefully cut the tomatoes between the two plates. Just in one shot, you get all tomatoes cut.